Due to its popularity I thought it would not be a bad idea to give you a detailed overview of Fireworks from Scitec Nutrition's WOD CRUSHER product family. 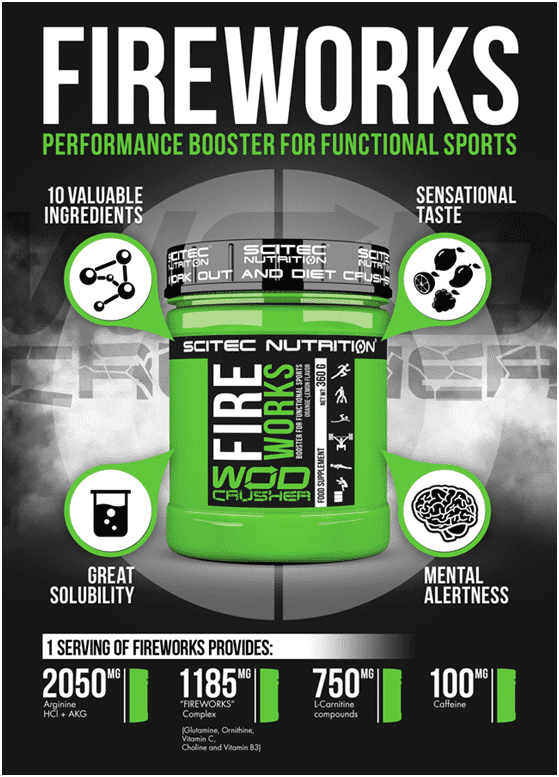 Fireworks is designed with the science of functional sport performance enhancement in mind. It features great solubility and sensational taste. The formula was put together without Creatine so that the individual can decide to use that ingredient or not, and on its precise doses. This way Fireworks is a more versatile energizer formula. It provides 10 valuable ingredients in an integrated way to boost mental focus and to optimize some of the crucial systems in your body. 1) Role in augmenting nitric oxide. 2) Role in the secretion of endogenous growth hormone. 3) Involvement in the synthesis of creatine. One of Nitric Oxide’s (NO) functions is to deliver messages between the body’s cells. It also plays a key role in controlling the circulation of blood. From a muscle hypertrophy perspective, NO affects the release of hormones and adrenaline. It increases the blood flow due to being a powerful vasodilator, hence it helps with nutrient delivery to muscles, helping them grow and recover faster. Pretty good, right? L-carnitine is synthesized primarily in the liver from the amino acid Lysine and Methionie. It is most abundant in tissues that use long-chain fatty acids as their primary fuel, such as skeletal and cardiac (heart) muscle. L-carnitine plays an important role in energy production by conjugating long-chain fatty acids for transport into the mitochondria where ATP (energy) production is carried out from the oxidation of these fatty acids. 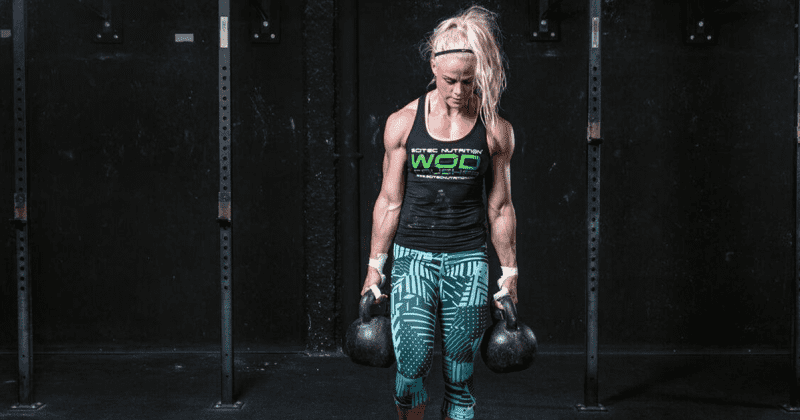 Needless to say that increased energy production means better performance during your workouts (WODs). Caffeine has effective ergogenic aid (performance booster) in both endurance exercise and short burst of maximal intensity training (e.g. : sprints, intervals). Caffeine has been shown to increase workloads by decreasing the rate of fatigue and lowering the perception of effort. It is important to note that doses will vary from person to person. If you are a habitual coffee drinker, you might need more caffeine to get focused. You’ll have to play around the exact dosage so you can figure out what works best for you. Choline aids in the synthesis and storage of acetylcholine. More acetylcholine available in your neurons, means better communication and stimulation of the Cholinergic receptor sites in the brain. This leads to a number of different positive effects for mental capacity including improved memory and learning abilities. Choline contributes to normal lipid metabolism and to the maintenance of normal liver function. All these benefits may help an athlete during those heavy Oly lifts and metcons, for sure! Alpha-Ketoglutarate (AKG), Glutamine and Ornithine are amino acids that are key intermediates of important metabolic cycles. Athletes and biochemists claim as well that Glutamine is the king of amino acids due to its really complex role in the human body (Nitrogen/Ammonia elimination through the production of urea, NO production, cell division signal, etc. ), and together with Ornithine they have a NO production role through the production of Arginine. So in a complex way these 3 amino acids may have a role in metabolic cycles resulting in Arginine production, which – together with Arginine in the FIREWORKS formula – would result in excess NO production in the body. The significant amount of Vitamin C in the product contributes to the normal function of the immune and nervous systems, and to the reduction of tiredness and fatigue. It also helps to maintain the normal function of the immune system during and after intense exercise (the beneficial effect is obtained with a daily intake of 200 mg in addition to the recommended daily intake of Vitamin C)! Niacin (Vitamin B3) contributes to normal energy-yielding metabolism, normal functioning of the nervous system, normal psychological function and to the reduction of tiredness and fatigue. The dosage profile of Fireworks is such that multiplied doses can be taken if one wishes to do so. When having multiple workouts per day, I would suggest to take 1 or 2 servings/ session. If you have just one workout perc day, I would test my caffeine limits by trying 1 to 3 servings 20-30 minutes before session. As I have mentioned before, it is important to note that doses will vary from person to person. People who do not drink any coffee should be careful, I would suggest ½ serving the first time. But if you have no problem with elevated caffeine consumption then 2-3 servings would give you a better boost in mental alertness and physical performance. So I guess it is time to take your Fireworks and hit the box!